In the Bible, ants are extolled as being wise insects that store up food during times of plenty and therefore are perfect examples for people who might lack a proper work ethic or fiscal savvy. Of course, when these little insects invade your home or are found on your roof, not even their biblical example is sufficient to prevent homeowners from going on the offensive. While spraying is usually the first course of action, it is not always the wisest. Here's how to get rid of ants on the roof for good. Trace the ant infestation to its origin. Although it is tempting to spray everything in sight with any one of the commercially available ant sprays, you would only be temporarily putting a hold to the actual problem: the nest with its thousands of other ants. Since most ants move on clearly defined trails, spend a bit of time watching the little creatures and see if you can determine their point of origin. Get close to the origin of the infestation. You may find that the ants have moved in through a tiny hole underneath a window sill or live in or around the chimney. This will be the primary focus of your attack on the ants on your roof. Climb up into your attic if there is no external source of infestation and the only ants you see are strictly on the roof. Go up during the daytime, armed with a flashlight and check the area underneath the portion of the roof where you noticed the ants. It is possible that they moved in underneath your roofing materials and might have burrowed through into the attic area itself. You should be able to see evidence of their activity by finding the pheromone trails ants leave behind. These trails usually originate at the nest and you may be able to find it by following them. Try to identify the ants you are seeing to the best of your ability. 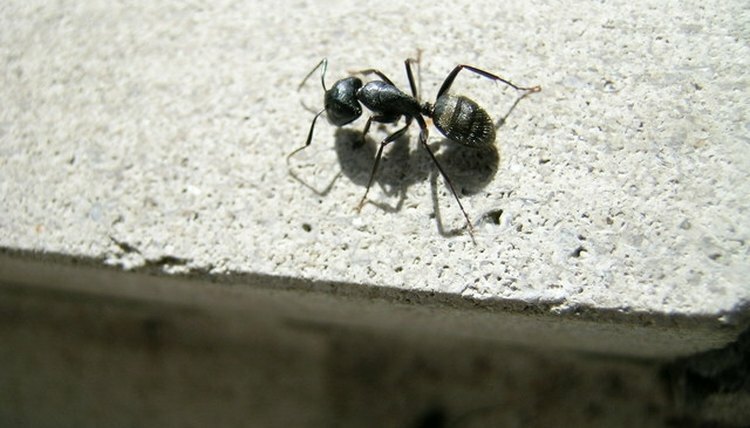 While many commercial ant killers will eliminate any number of ants, knowing whether or not you are dealing with the dreaded carpenter ants or feared fire ants will most likely determine how to deal with potential damage after eradicating the colony. In the case of carpenter ants, you most likely need to check the soundness of the wood beams under your roof since the ants might have hollowed them out for nesting purposes. In the case of fire ants, there is a chance that you might not have gotten rid of all the ants and greatest care must be taken when upsetting a colony of red ants. Place poisoned ant bait around the entrance area of the colony’s nest, at the apparent target location of the colony’s trail, and also at sporadic locations on the trail itself. Step away. It is hard to let the ants continue on their merry way but for the poison ant bait to work, it is crucial that the workers be allowed unfettered access to the bait stations. Let this continue for as long as you notice some ant activity in and around the bait. Remove bait stations when ant activity ceases. Dispose of the traps by first placing them inside a plastic bag and then directly placing them into a trashcan. Thoroughly clean the roof area. Sweep off any leaves, branches or other dead vegetation that might have served as an attractive area for ants to hide under. When you are satisfied that all debris has been removed, hose the roof clean with clear water. Let the water dry and apply ant spray. This is an optional step, but usually a good idea to ward off any future infestations by ants who might like the idea of having the roof cleared of their enemies or competition. Return to the source of the infestation and seal the area with caulk. If you notice structural damage, you may need to replace some wood—as might be the case with carpenter ants—or simply put some putty over the caulking once it has dried. Prevent future infestations on your roof by checking nearby trees close to your home—or with branches hanging over your roof—for ant activity. Prune tree limbs that hang over your roof or that touch your house and prevent ant colonies from climbing up the trunks of such trees with the help of commercially available tree bands. Protect birds from the poisoned bait by fashioning a simple cover for the bait stations with the help of a box that fits over the actual station. Cut a couple of holes in the front and back toward the bottom of the box to let the ants pass through. Do not ignore ants on your roof as they might actually be causing serious structural damage to your roof by hollowing out wood beams.